The MAJOR will be held on the weekend of 19th and 20th January 2019. The registration deadline is Monday, January 14th, 2019, at 9 pm. Registration for the competition is set at € 12 in categories open and veterans, € 8 for all others categories (including international taxes). 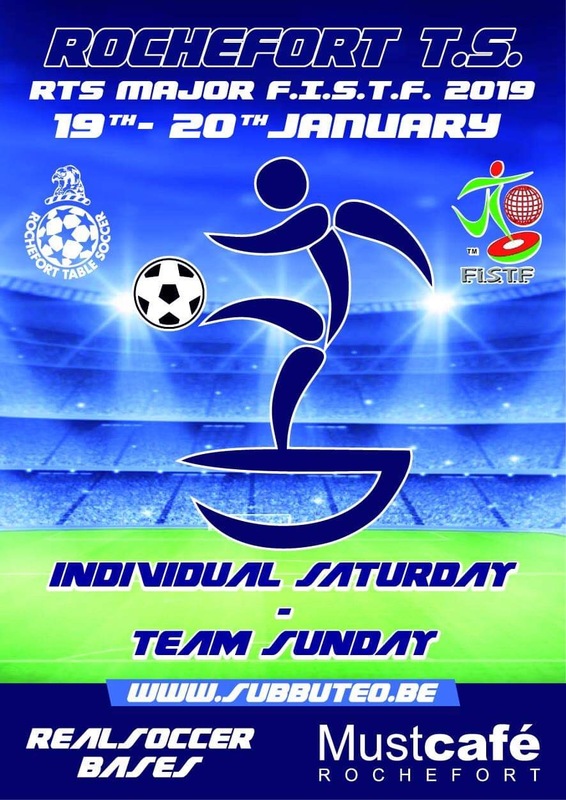 Registration for the teams competition is fixed at € 25 per team (international taxes included). Our parter hotel Le Domain du Vieux Moulain d'Eprave propose you a special discount using promo code subbuteo2019. We also invite you to visit sites such as BOOKING.COM or GITES DE WALLONIE to discover other hotels and cottages around Rochefort. Saturday 8:00 am: welcome 8:30: start of individual competitions. Finale : around 18h Sunday: 8:00: welcome 8:30: start of the team competitions finale around 17h30 The players have to choose the category in which they wish to participate. It is not possible to combine 2 different categories. Warning : The venue might not be accessible friday. For the season 2018/2019 the categories are the following: Open Veterans: players born before September 1st, 1974; Under-19: players born from September 1st, 1999, until August 31st, 2003; Under-15: players born from September 1st, 2003, until August 31st, 2006; Under-12: players born from September 1st, 2006 onwards; Ladies: female players only, of any age. The top four in each category will be rewarded with trophies or medals. In the open category, they will receive the following amounts: the winner: € 240, the finalist: € 120 and the semi-finalists: € 70. The rules used shall be those adopted by the Belgian Federation in accordance with those used by the International Federation of Table Football. Each player commits to respect this regulation. FISTF rules will be applied for all competitions. The MAJOR will be exclusively played on Astroturf « fast track » (Astrobase). Wearing sportswear (club) is mandatory during the tournement. During the competition, a fastfood service will be provided in the sports hall. Please note that it‘s forbidden to enter the sports hall with food and drinks. Food and drinks must be consumed in the cafeteria Please note that each team will be asked a deposit of 50 euros by RTS for the name plates. The deposit will of course be given back in return of the plates.